Now we used the anti-BAG3 mAb in combination with an anti-PD-1 antibody to treat mice PDAC allografts. To this end, murine Kras-driven pancreatic cancer cells (mt4-2D)6 were subcutaneously grafted in syngeneic immunocompetent (C57BL6) mice4 and when tumours size reached about 100 mm3 mice were treated for 19 days with an anti-BAG3 mAb, an anti-PD-1 antibody or a combination of the two. Histochemical staining showed that tumours appeared as low differentiated pancreatic adenocarcinoma; as expected for tumours derived from K-Ras-mutant cells, all tumour showed high expression of phospho-ERK (online supplementary figure 1) Treatment with either anti-BAG3 mAb or anti-PD-1 antibody resulted in a significant reduction of tumour growth that was even more impressive when the two antibodies were used in combination, suggesting that the block of BAG3 activity was additive with the block of PD-1 (figure 1A) as demonstrated by the not significant interaction term in a two-way analysis of variance (online supplementary figure 2). As previously reported, treatment with anti-BAG3 mAb resulted in reduced macrophage infiltrate4 that on the contrary appeared to be increased in anti-PD-1-treated animals (figure 1B). Interestingly, the macrophage infiltrate was also reduced in the animals treated with the combination of the two antibodies. Analysis of tumour sections showed that CD8+ cells were hardly detectable in control tumours, while their number was increased following treatment with anti-BAG3 or anti-PD-1 antibody and a higher effect was observed in mice treated with the two in combination (figure 1C, D). 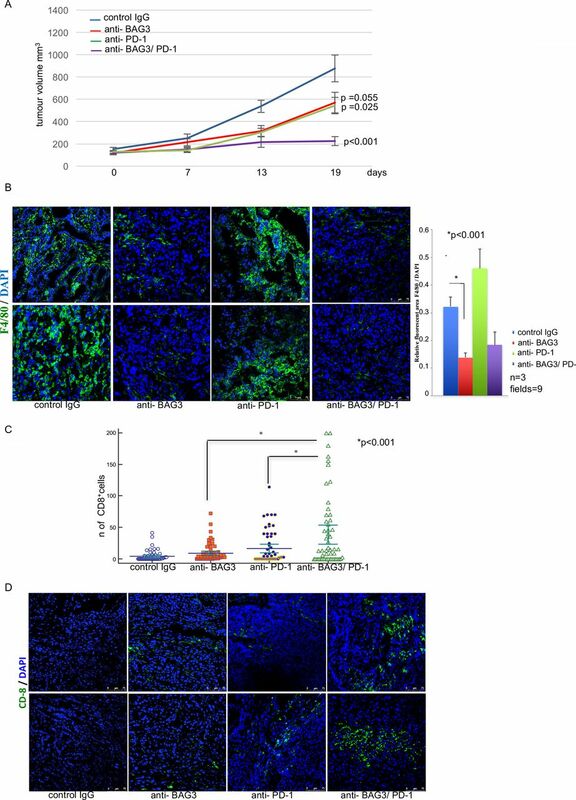 Combined effect of anti-Bcl-2-Associated athanoGene 3 (anti-BAG3) and anti-PD-1 antibodies in inhibiting pancreatic ductal adenocarcinomas growth and increasing the number of CD8+ cells in tumours. (A) Tumour growth of syngeneic grafted tumours treated as indicated. (B) Analysis of macrophage infiltrate in tumours by F480 staining. (C) Count of CD8+ infiltrating lymphocytes in tumours. (D) Representative images of CD8 positivity in excised tumours of the four different groups. For more details see online supplementary information. In conclusion, blocking BAG3 activity results in an increased number of CD8+ cells, with potential antitumour effects. Such increase is likely to be due, at least in part, to the decrease of TAMs-derived factors4 that suppress CD8+ lymphocytes influx or subsistence in tumour tissues. Whether BAG3 also impacts on other regulatory circuits requires further investigation, nevertheless, our observations disclose a BAG3-mediated mechanism that suppresses CD8+ cell recruitment. Furthermore, our findings indicate the potential effectiveness of anti-BAG3-directed and anti-PD-1-directed strategies in fighting pancreatic cancer. This work was supported in part by Associazione Italiana per la Ricerca sul Cancro (AIRC IG-14701) to MCT (AIRC IG-15196), VDL and (AIRC IG-18467) GS and by Ministero dell’ Istruzione, dell’Università e della Ricerca (PRIN 2012CK5RPF_003). We acknowledge Professor Dave Tuveson for kindly providing murine Kras-driven pancreatic cancer cell line (mt4-2D). VI and AR contributed equally. Contributors VI, AR, MCT and VDL were involved in the study concept and design and drafting and revision of the manuscript. VI, AR, RDA, MDM, LM, AB, MF, MP, MC, GS, MDN, RL and VD were involved in acquisition of data, analysis, interpretation of data and statistical analysis. PR and GA provided technical support. Competing interests AR, MDM, LM, AB, MF, MP, VDL and MCT are shareholders of the Academic Spin-off BIOUNIVERSA that provided anti-BAG3 antibodies. The remaining authors declare no competing financial interests.